If in a previous article, we told you all about how to grow your own wedding flowers, it’s time to put those flowers to good use by turning them into lovely DIY wedding centerpieces. Especially if you’re a crafty person, but also if you’re simply ambitious and want to involve yourself in your wedding planning as much as possible, making your own centerpieces is a great idea. Not only will you be able to decide exactly how they’ll look, but you’ll also get to tell everybody that the centerpieces they’re raving about are your creation. Today, we’re going to look at 10 DIY wedding centerpieces that are guaranteed to take your breath away. 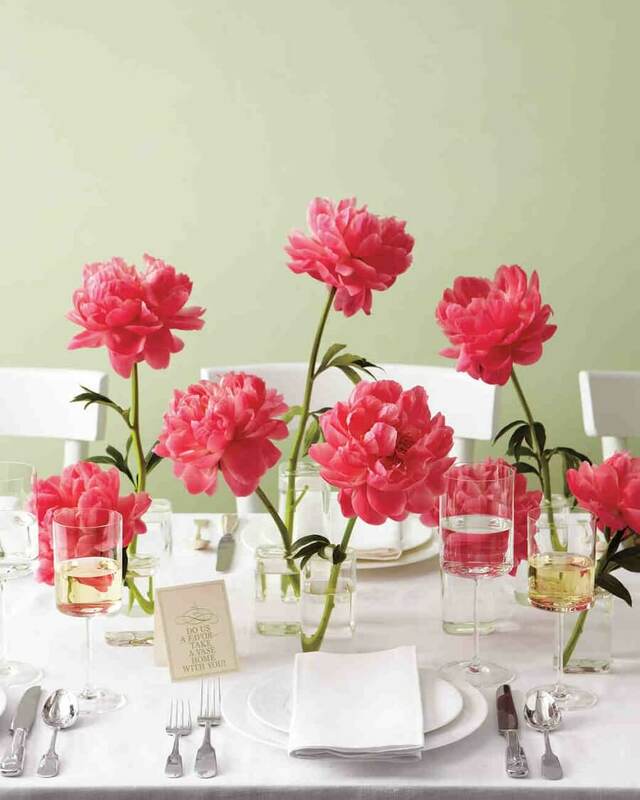 If you’re not one for complicated wedding centerpieces, but you still want the tables at your wedding to look great, then you should take a look at these peonies centerpieces. Peonies are quite easy to grow yourself, and they look truly gorgeous. The color of the peonies depends on your own personal preference. If you want the traditional wedding peonies, you can always grow white ones. However, allow us to suggest some dark pink ones which will be the talk of the party. 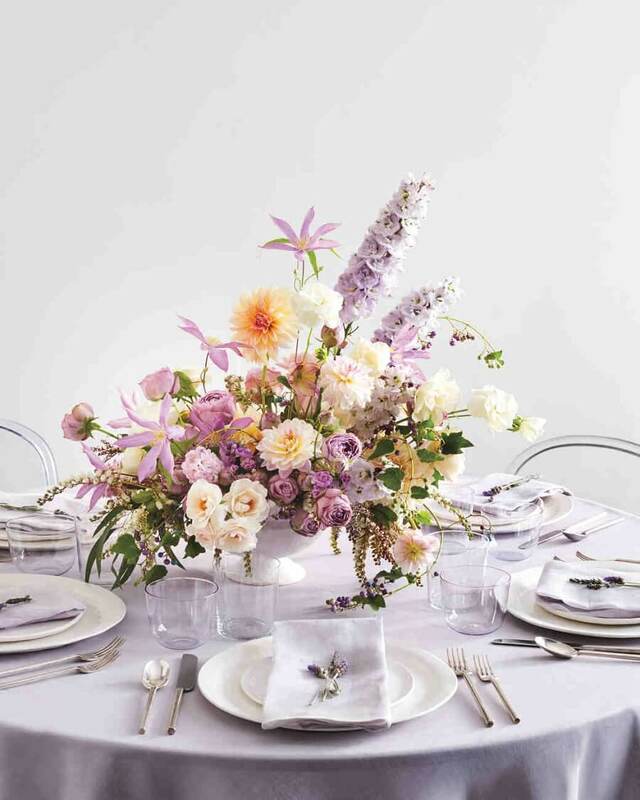 All you need in order to create the centerpieces above are some clear vases (so as not to clash with the color of the flowers) and plenty of pink peonies. Keep only a couple of leaves on the peonies, and then place them in water. If you want your guests to have a memento from your wedding, you can also turn the centerpieces into favors. That way, they can take them home once the party is over. For the people who’ve always dreamed of a really detailed and lush wedding centerpiece, there’s always the possibility of combining a couple of flower varieties and creating a large container that you place in the middle of the table. For instance, the centerpiece above contains hellebores, garden roses, andromeda, clematis, dahlias, porcelain vines, and delphiniums. If this sounds like too much for you, you can always choose only a couple of the aforementioned varieties. Still, there’s no denying that the combination is quite gorgeous as it is. The muted shades of the flowers, combined with the white porcelain container make this centerpiece a really romantic choice. We especially love the insistence on faded purple tones. If you’re one for crazy DIY wedding centerpieces, then you’re definitely going to love this option. Why stick only to flowers when it comes to wedding centerpieces if you can also include fruits? It’s not often that you see such centerpiece options at a wedding. So if you want yours to be unique, don’t be afraid to experiment. 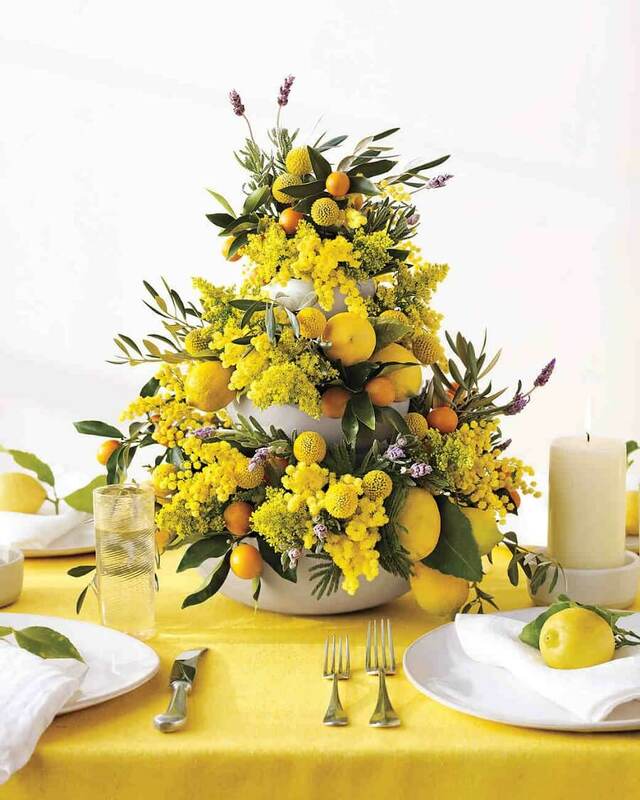 The centerpiece in the image above contains goldenrod, mimosa, olive leaves, craspedia balls, fresh lavender, kumquats, and lemons. What makes this centerpiece even more impressive is the fact that it’s also tiered. This provides it with more structure and layers. You can also notice that there are some lemons placed on the plates, which we think is a really awesome and creative idea. In terms of DIY wedding centerpieces, these ones are definitely a challenge to make. That’s because they require more time and skill. Still, you can’t deny that the end result is pretty spectacular. 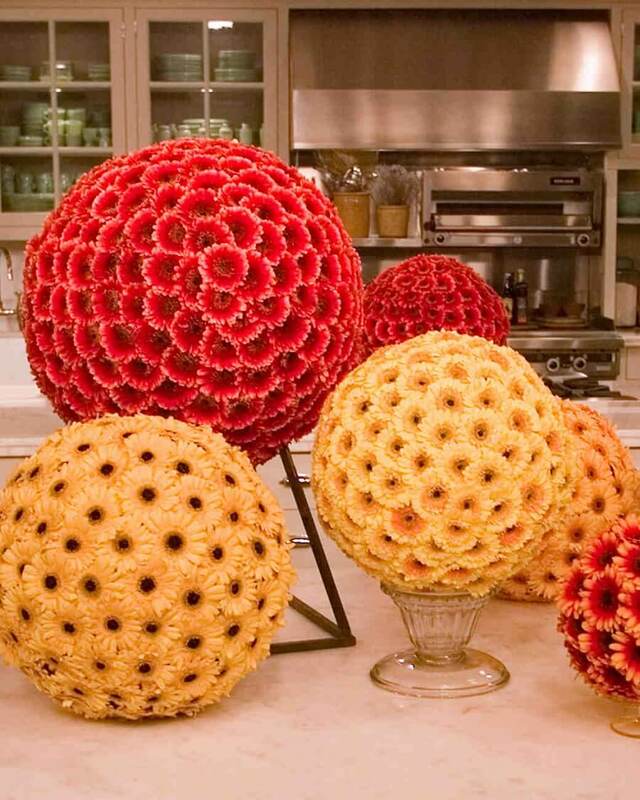 If you’re tired of the same old when it comes to wedding centerpieces, spruce things up with some spheres made entirely of colorful daisies. Whether you simply decide to place the centerpieces on the table as they are or put them on top of a pedestal, your guests will definitely wonder where you got them from. The color of the spheres is completely up to you. However, keep in mind that you’re going to need a lot of flowers to create these centerpieces. The ones above are made using orange and red gerbera daisies. You can tell by the perfect shape of the sphere that they require intricate work. Another really interesting idea for some unique DIY wedding centerpieces is to use flower pots instead of a vase or a bowl. This is another type of centerpiece that you can also use as a wedding favor. What makes everything even more personal is the fact that you can write the names of each of your guests on the pots. That way, they’ll know you’ve thought of them when making the centerpieces. 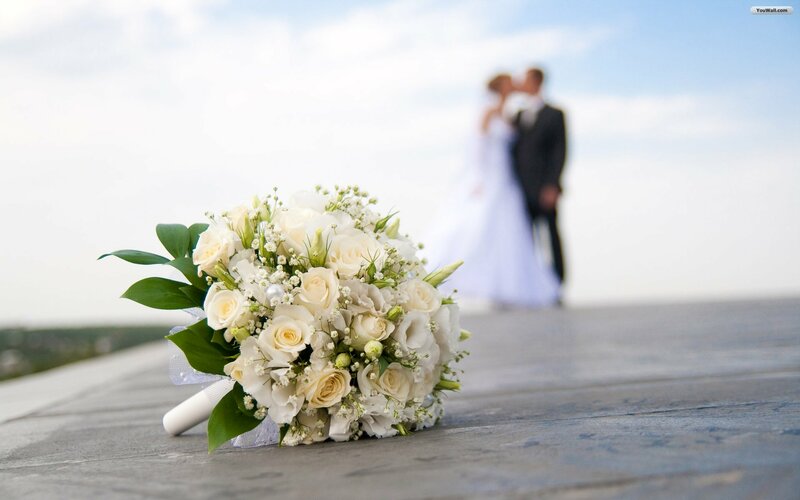 Especially if you have a smaller wedding with only your family and a couple of close friends, you can go one step further and create the centerpieces according to each person’s favorite flowers or colors. Which means that you also have a certain amount of creative liberty. Moreover, you don’t have to worry about all the centerpieces looking the same. As you can see, the ones in the image above contain a lot of different flowers, each of them more colorful than the next. 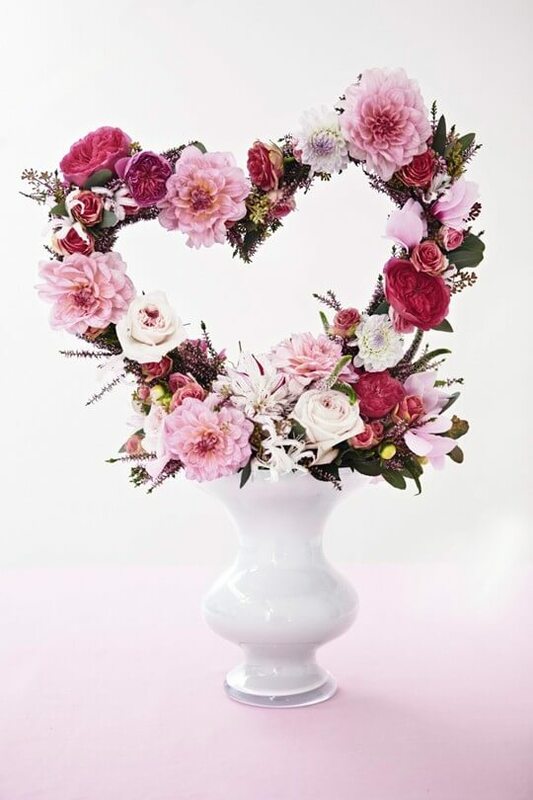 If you’re an extremely romantic person, and you want your DIY wedding centerpieces to reflect that, then allow us to suggest these lovely ones shaped like a heart. 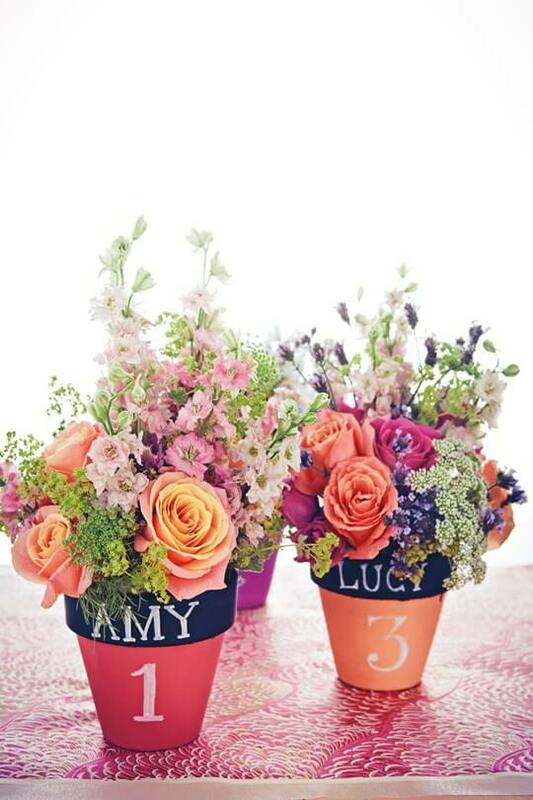 You can use any type of flowers you want and play with different shades in order to create some contrasts. The trick is to place the flowers on a wire that you shape like a heart. This design also takes a while longer to complete. Even so, it’s definitely one that your guests are going to marvel at during the wedding reception. As in the image above, keep the container as simple as possible by going with a white porcelain vase. After all, the flowers are the ones that should stand out. And they do indeed, not only because of their shape but also because of the color choices which complement each other wonderfully. If you don’t want to invest that much time and effort into making your own centerpieces, then you’re going to like these DIY wedding centerpieces. 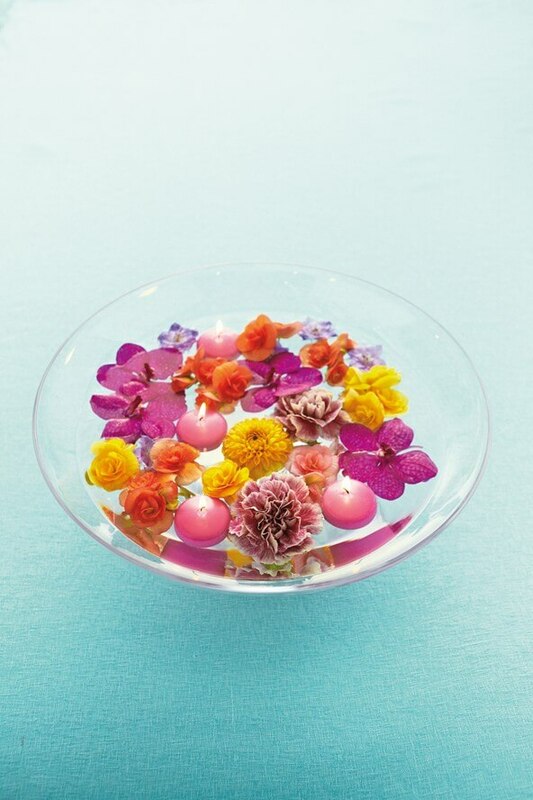 They contain a bowl filled with water and sprinkled with flower petals and small candles. This design also implies that you’re not going to need a lot of flowers. Consequently, it’s perfect for you if you don’t have a large garden. All you need to create these centerpieces are some clear bowls, water, different flower heads, and some small candles. Sprinkle the petals on the water according to your preference, add three or four candles (depending on the size of the bowl), and you’re good to go. This will prove to be a really chic and romantic centerpiece option. For people who are into quirky wedding decorations, some DIY wedding centerpieces made of huge colorful cups filled with flowers are a perfect idea. In order to complete the tea party look, we advise you to find cups that come with plates as well. Another tip would be to match the color of the cups with that of the flowers you’re going to use. 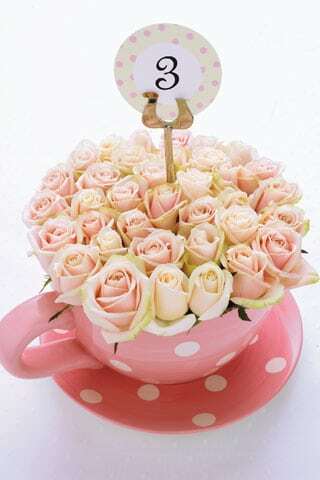 For instance, in the image above, the pink cups sporting white polka dots were filled with a multitude of truly gorgeous tiny pink and yellowish roses. You can also use the centerpieces to display the number of tables. That way, your guests can quickly find their way around. 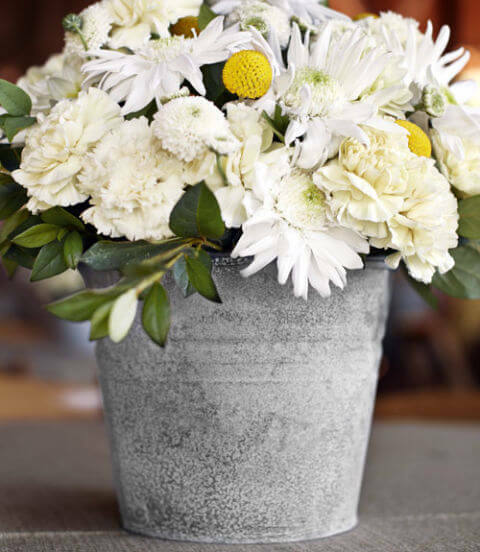 What better way to contrast DIY elegant wedding centerpieces with a touch of vintage charm than by placing white flowers into an old metallic bucket? Metallic buckets are all the rage right now, the more vintage-looking, the better. So if you can’t find buckets that already look like they’re decades old, you can make them look that way. How? By spritzing them with bleach, as in the picture below. All you need to complete this look are some mums and white carnations, and you’re done with your wedding centerpieces. For a more natural and outdoorsy look, we recommend you to leave plenty of foliage on the flowers and allow it to peak through the bucket. 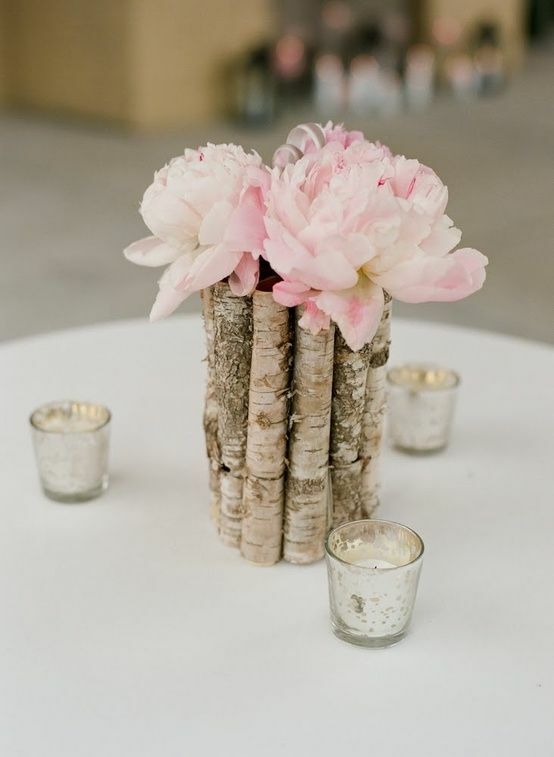 Speaking of more rustic DIY wedding centerpieces, our final suggestion involves these really creative centerpieces made of peonies and small tree branches. The flower choice is completely up to you. This idea would look nice no matter the kind of flowers you decide on. What makes the entire design stand out are the flower containers which have been made of tree branches. Especially if your wedding is outside, and you’re a fan of rustic elements, you should definitely consider getting crafty with these wedding centerpieces. It might take a while to complete them, but they’ll definitely improve the look of your tables. 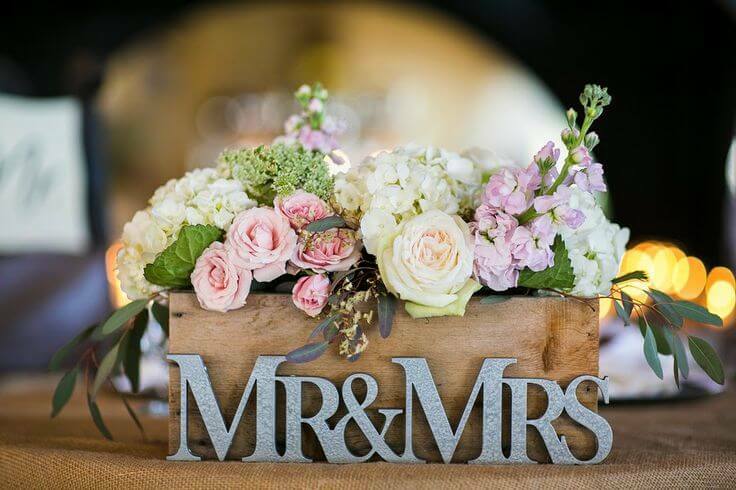 No matter what kind of bride or groom you’ll be, either one who prefers romantic flower centerpieces, or one who is more into colorful and daring options, we hope today’s guide has provided you with some DIY centerpiece ideas that you’ll consider for your own wedding. With these DIY wedding floral centerpieces, it’s easy to bring a personal touch to your wedding planning. Just remember to decide on the perfect centerpiece ahead of time, so that you can grow your own flowers according to our previous guide.